Vehicle Graphics | Shelton Sign Co. Vehicle graphics are any markings on any type of vehicle. The graphics may be company name, phone, and address only, or it may involve full color, digitally printed, large-format photographic images. These graphics can go on just about any vehicle; cars, trucks, vans, boats, helicopters, planes, motorcycles and trailers. Advertising on Wheels vehicle graphics are in public view nearly constantly. As such, they are excellent marketing tools. Look around, everyone's doing it. And for good reason, it works. Your vehicles make public appearances every time they hit the road. 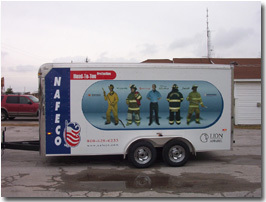 Professionally done, vehicle graphics speak volumes about your company.